Anyone who’s spent any time watching TV shows about real estate, and house flipping have seen the extra work that sellers do to ‘stage’ the home. Some fresh paint, new landscaping, rented furniture and a plate full of fresh cookies in the kitchen presents the home in it’s best light. Brazilian real estate company Carvalho Hosken had decided to launch a new condominium in an affluent area of Rio de Janeiro. Their challenge was to market the condos as tailor-made without sounding like a bad real estate ad cliche. The company prepared a decorated unit complete with digital frames that pulled in and displayed photos from the customer’s Facebook photo albums (the customers had been asked to reserve a showing using their Facebook profile). Using the work address from their profile, the best route was plotted onto a map. Did it work? According to the video 28% of visits were converted into sales (three times the normal success rate). The Social Home Tour was created by Brazilian agency Artplan. Delvinia President, Steve Mast sent me this poster/billboard this morning. Real estate companies have been early adopters of mobile barcode technology so it’s not surprising to see them used in their outdoor advertising. This is a good execution of highlighting the QR Code in the creative. The headline ‘Does Your Home Need a QR Code’ makes a direct reference to the large mobile barcode underneath. In a recent survey by AskingCanadians, almost 87% of respondents who own smartphones recognize what these codes are used for, so making reference to a QR code in an ad makes perfect sense. Based on this high recognition factor, it may not be necessary to provide directions on every usage of QR codes in the future. The need for instructions may depend on your audience – are the majority of them smartphone users? The Remax.ca URL incorporated into the border of the code provides an alternative way to access the content for users who don’t want to use a mobile barcode scanner app. 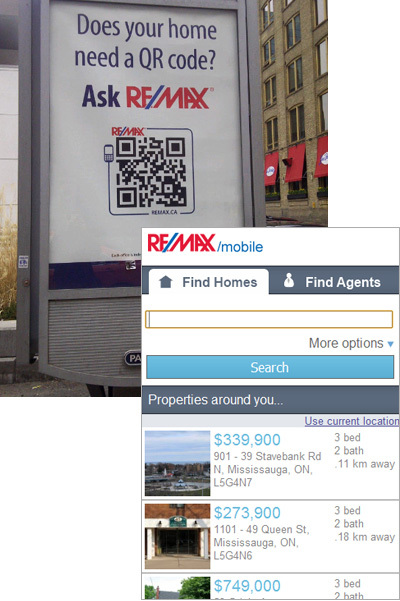 Once scanned I was redirected to the Remax.ca mobile page, where the page requested to use my location. Once I had given the page my location, Remax properties in my area were displayed.